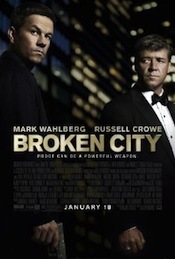 Allen Hughes’ first solo directing effort away from brother Albert stars Mark Wahlberg as a New York cop who ends up in the crosshairs of the city’s powerful mayor (Russell Crowe) after uncovering a scandal involving the mayor’s wife (Catherine Zeta-Jones). Oscar-winning The Social Network co-composer (with Trent Reznor) Atticus Ross, who previously scored the Hughes Brothers’ The Book of Eli, here reteams with wife Claudia Sarne and brother Leo Ross for a dense, chillingly techno-noir score reminiscent of the trio’s previous work for the Hughes Brothers’ television series “Touching Evil.” Bearing the familiar industrial signatures associated with the Nine Inch Nails sound that Ross and Reznor helped pioneer, Broken City's score is a masterpiece of electronic tension and texture, capturing the ominous foreboding and brooding alienation of its modern-noir storyline with breathily pulsating chord arrangements that evoke New York’s reputation as a labyrinthine, politically unpredictable urban jungle. Noteworthy tracks include "Broken City," "Broken Men," "Valiant" and "Baptism." Opens with a poignant melody in a desolate, droning atmosphere. Upbeat, electronic rhythms begin at 3:30. Slow electronic melodies play in a vast, electronic soundscape.